GotSearch.co.uk is a search engine that might arrive on your computer together with a variety of free programs and then change the settings of your browsers. According to numerous users’ complaints, GotSearch.co.uk appears as a homepage, search engine, and you might see it even if you open your New Tab page. GotSearch.co.uk is developed by Got Search company and it is often classified as a browser hijacker by many researchers because this search engine applies changes to all the browsers without permission in most cases. You can, of course, remove GotSearch.co.uk from your browsers but it might be really difficult to do that because this search engine cannot be deleted via Control Panel easily. Luckily, you have visited this web page and are reading this article – we promise you will find help here. Specialists say that GotSearch.co.uk is targeted at people living in Eastern countries. As has been mentioned, the first thing it is going to do is to apply changes to all the browsers. If you do not do anything about that and continue using GotSearch.co.uk, you might be provided with untrustworthy advertisements. The owner of GotSearch.co.uk expect you to click on them because it gets money for that (i.e. driving traffic to different websites). As you can see, it does not matter that GotSearch.co.uk promises to provide users with videos, news, images, and shopping search results, it will still show advertisements to you. This might put your system into danger because these ads might take you to unreliable web pages that promote malicious software. It is not surprising at all because these external links to other websites are not monitored by the publisher of GotSearch.co.uk. What is more, it has been also noticed that GotSearch.co.uk will collect such information as your IP address, PC’s location, email address, and other details related to your Internet browsing. Some specialists also say that it might touch personal details without permission. Therefore, we believe that it would be clever to uninstall GotSearch.co.uk completely and then set another homepage, search engine, and new tab page. How did GotSearch.co.uk manage to enter my system? There is no doubt that GotSearch.co.uk has entered your system together with other free programs. There are many of them on the web, so if you have recently downloaded and installed one on your PC, GotSearch.co.uk browser hijacker has slithered onto your computer together with it. Delete all those programs after you delete GotSearch.co.uk. How can I remove GotSearch.co.uk? 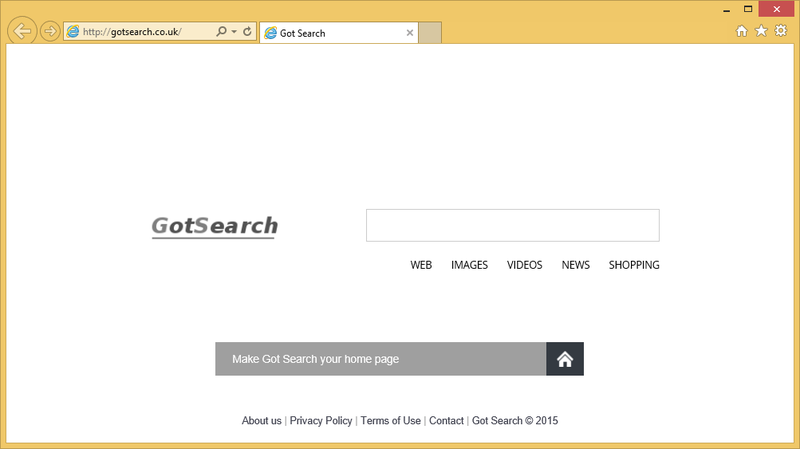 GotSearch.co.uk search engine can be erased from browsers manually or automatically. All in all we advise to scan your system with an automatic tool to delete GotSearch.co.uk completely. An automatic tool will erase other unreliable programs that might be installed on your PC but, most importantly, you will not need to take care of the GotSearch.co.uk removal yourself.